Tiny Owl’s biggest books of 2017! You are here: Home / Tiny Owl’s biggest books of 2017! As 2017 draws to a close, we thought we’d take a look back at our bestselling titles of 2017 – and take a sneak peek at next year! This beautifully simple yet powerful poem of hope and change by Ahmadreza Ahmadi, one of Iran’s greatest contemporary poets, is brought to life by the stunning illustrations of Ehsan Abdollahi. When Ehsan was denied a visa to visit the UK in summer 2017, there was a huge public outcry, and many people protested the decision by buying the book. Now it’s been refreshed for a second edition, with a new cover design and an activity page. 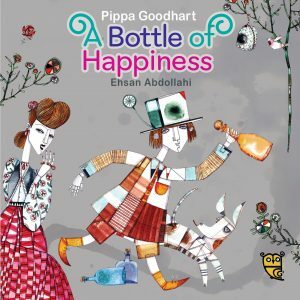 Pippa Goodhart’s fable-like tale of sharing, overcoming boundaries and learning the value of happiness is an essential book in such divided times. Our second title illustrated by Ehsan Abdollahi is one of two Tiny Owl books recently nominated for the 2018 CILIP Kate Greenaway Medal, as well as being listed among CLPE’s best books of 2017. And it is now out in paperback! This simple yet sophisticated tale about how generous we can be to others is written by Laleh Jaffari. 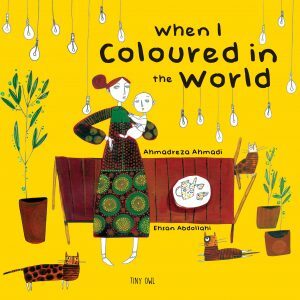 Ali Khodai’s bright, characterful illustrations led to this book being our second title nominated for the 2018 CILIP Kate Greenaway Medal. It’s also been a year of firsts: in 2017 we’ve published the first titles in two brand new series. 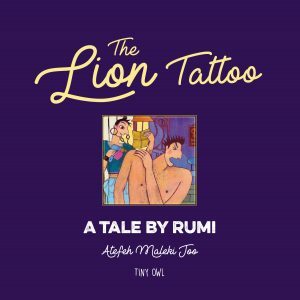 The Lion Tattoo is our first picture book for ages 16+ and is guaranteed to make you think as well as laugh. 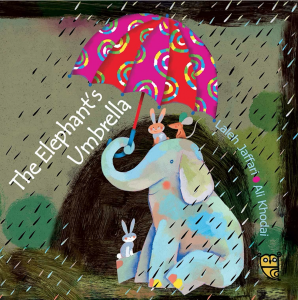 Based on a tale by Rumi, this humorous yet philosophical picture book for adult readers is fabulously illustrated by Atefeh Maleki Joo. With its luxurious cloth cover and small format, it also makes a perfect gift book, ideal for Christmas. 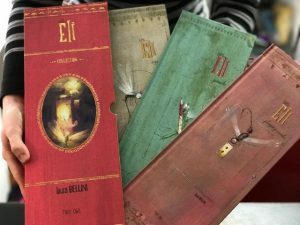 The first in our series of wordless picture books is the beautiful Little Eli collection by the wonderful Italian debut illustrator Laura Bellini. It’s a story of willpower and imagination, and the gorgeous and quirky illustrations in these wordless books can be enjoyed by readers of any age. With its unusual large-format size, and housed in a beautiful slipcase, Little Eli makes a perfect set of gift books, ideal for Christmas. 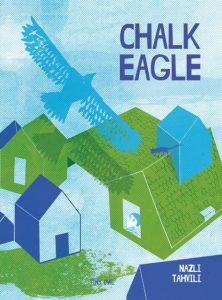 And finally, as promised, a sneak peek at our next wordless picture book, published on 29 January 2018: Chalk Eagle! With original screenprinted illustrations by the award-winning Iranian artist Nazli Tahvili, this wordless picture book is a testament to the power of imagination and brings to life every child’s dream of soaring into the sky. Keep an eye out for more information coming soon. Or, if you’re already keen, you can pre-order the book here.